We recently attended the 2018 Business Travel Show, Europe’s largest business travel convention. Thousands of professionals touched down in London for two days of workshops, exhibitions, and speakers on the ever-evolving business travel world. We discovered a few common threads while meeting and greeting. Here, we’ve compiled some of the most common ideas we picked up between handshakes and lunches. If a company travel policy is inefficient, it makes sense that employees will continue to book travel outside the guidelines. Sounds obvious, right? We talked about this in our previous post on the fundamentals of a true “traveller-first” policy, and it’s more important than ever as travellers skew younger and expect your travel program to support new conveniences (think the boom in bleisure travel). This piece of advice covers the spectrum of employee travel, from booking, to on-the-road, to expensing when they’re back in the office. Whatever the step in the process, make sure you’re regularly auditing your toolset and surveying your employees to ensure they have the tools they need to comply with your travel policy. Reliability and ease of use are important factors when considering a business’s ground transportation needs. Can the rides arrive on time? Will the correct vehicle arrive? Did your traveller need to jump through hoops to book this ride? Is expensing effortless? 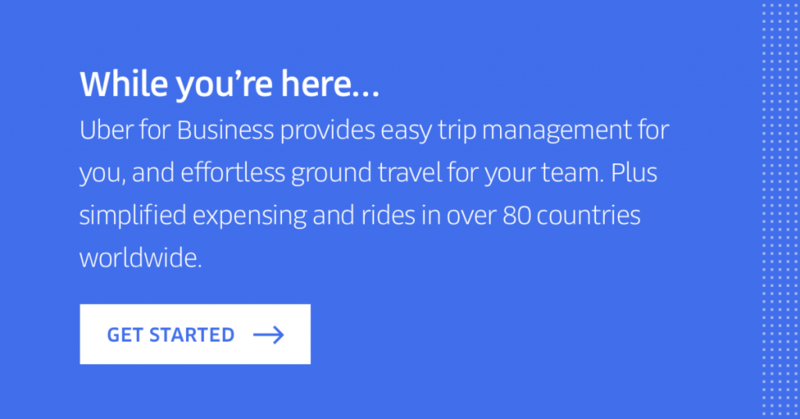 On the back end, how will the travel manager track amount spent on ground transportation? How can he or she validate that a ride was for business purposes? Ground transportation logistics solutions such as Uber for Business simplify the entire process, from requesting a ride to managing spend. Travellers can spend less time expensing rides, and travel managers can even control class of vehicle and cap daily spend. Best of all, they are already familiar with the app. Just because millennials use apps doesn’t mean that travel managers should pick an app out of a hat. At Uber, we believe that travel solutions should be intuitive, easy to navigate, and even familiar. Creating a smoother transition to a new tool is sure to encourage higher rates of compliance in the long run. Why force travellers to create new accounts, download new apps and learn new systems when they already have and know the apps they use every day? Also, it helps to stay in touch with your travellers after you implement a new tool. Consider sending out a survey or having a quick meeting to solicit feedback – do they find the tools you selected to be useable and intuitive? Be sure to incorporate their feedback into your travel program, too. An empowered, aware traveller is a win-win for everyone involved in business travel. When it comes time to make those decisions, can travellers access the policy in just a click or two if they need a refresher? While travel policies can’t predict every possible scenario which may be encountered on the road, they can, and should, provide a well-constructed framework within which a traveller can feel empowered to make the right decisions within compliance. After all is said and done, your company’s travel policy comes down to just keeping it simple. Pages and pages of intricate rules make a travel program unnecessarily complicated. The more elaborate the travel policy, the harder it will be for the travellers to adhere to it and the travel manager to control it. Take a look through your current travel policy. If it can’t fit on one sheet of paper (in a normal type size! ), it may be time to revise. It’s not just about simplifying the rules, either – it’s about communicating them effectively. Think outside the box for this! Consider distributing a wallet-sized card which lists preferred suppliers, daily spend amounts, or other frequently asked questions. If infographics are an effective way to communicate with your travellers, embrace it! The bottom line is that your most frequent road warriors need to remember your travel policy, and your job as a travel manager is to make that as simple as possible for them. The end result is a satisfied traveller – and a low-leakage travel policy.